Located in the centre of Prague is the art nouveau Municipal House (Obecni Dum Praha), one of the city’s national cultural landmarks. Whilst this multifunctional building is a venue for conferences, congresses, concerts, balls and other events, it is also an important building in terms of Prague’s architectural and political history. Some of the most important Czech painters and sculptors were involved in the decoration of this building. 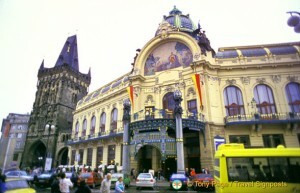 The Municipal House stands on land that was previously occupied by the King’s Court, the residence of King Wenceslas IV. It was built as a civic centre from 1905 and 1912 and the building is a mixture of several architectural and decorative styles and a range of materials were used. The eye-catching main facade of the Municipal House features a large ceramic half-dome mosaic above the entrance by Karel Spillar, titled Homage to Prague. Other allegorical groups of sculptures depict Nationalist themes like the Degradation of the People and the Resurection of the People, created by some of the leading artists of the time. The interior is just as decorated, with many outstanding features and artwork. There is a large art gallery in the Municipal House and its halls and lounges host hundreds of events each year, including conventions, social and cultural events, concerts, exhibitions and balls. For anyone interested in seeing art nouveau in Prague, the Municipal House can be visited by joining one of their many guided tours. The tour route covers the Smetana Hall – Confectionery – Moravian Slovak Parlour – Bozena – Nemcova Parlour – Oriental Parlour – Gregr Hall – Palacky Hall – Mayor’s Hall – Riegr Hall – Sladkovsky Hall – Wine Bar – and the American Bar. The concert halls of the Municipal House are some of Prague’s most impressive due to their superior acoustics. In particular, the Smetana Hall on the first floor, with its original organ from the high art nouveau period, is the most famous concert hall in the Municipal House. A huge range of musical events take place here, from pop to jazz and the best of classical concerts. It seats 1,200 guests and is the venue for Prague’s Spring festival, Summer concerts and Autumn festivals. See what’s on at the Smetana Hall and you can also book your Prague concert tickets HERE. The post The Municipal House – Prague’s Art Nouveau Treasure appeared first on Czech Republic Travel.